America is a wonderful and magnificent country that affords its citizens the broadest freedoms and the greatest prosperity in the world. But it also has its share of warts. It is embroiled in a war that many of its citizens consider unjust and even illegal. It continues to ravage the natural environment and ignore poverty both at home and abroad, and its culture is increasingly driven by materialism and consumerism. But America, for better or for worse, is still a nation that we have built. So why then, asks Albert Borgmann in this most timely and urgent work, are we failing to take responsibility for it? 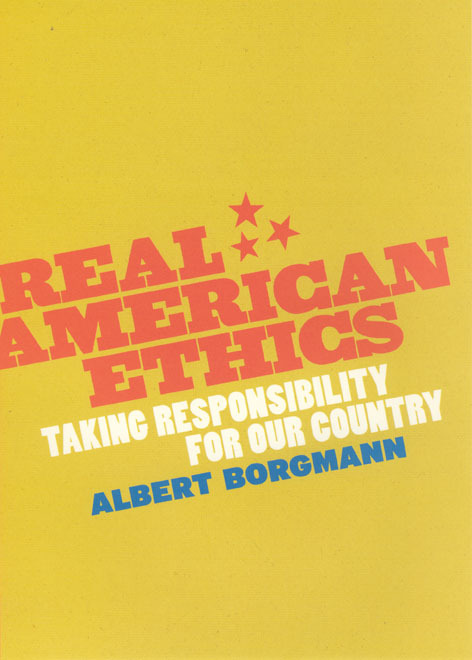 In Real American Ethics, Borgmann asks us to reevaluate our role in the making of American values. Taking his cue from Winston Churchill—who once observed that we shape our buildings, and then our buildings shape us—Borgmann considers the power of our most enduring institutions and the condition of our present moral makeup to propose inspired new ways in which we, as ordinary citizens, can act to improve our country. This, he shows, includes everything from where we choose to live and what we spend our money on to daunting tasks like the reshaping of our cities—habits and actions that can guide us to more accomplished and virtuous lives. Using prose that is easy and direct throughout, Borgmann’s position is grounded neither by conservative nor liberal ideology, but in his understanding that he is a devoted citizen among many. In an age in which the blame game is the only game in town, this patriotic book is an eloquent reminder of the political strength we all wield when we work together. "This delightful reflection on American ethics has a double appeal. On the one hand is Borgmann’s clear articulation of the predominant Kantian theoretical base and the desire for a workable practical ethics. On the other is his incisive criticism of the way ethical theory and practical ethics misses the heart of the American enterprise. . . . Highly recommened." "Solid and insightful. . . . Real American Ethics supports, enriches, and deepens important directions being taken in contemporary American ethics."